I use Goretex boots and heated insole on longer journeys. But when the leather of the boots gets soaked, my feet may be dry but the cold is a nightmare. These over boots keep the worst of the water off, the boots stay dry and I stay warm. The fit is such that even on my adventure boots I can cover most of the boot. Important when there's no drying facilities in hotels and campsites. They appear to be very good. The fit is just right. S for shoe size 39 and M for shoe size 41 are just perfect. Build seems OK too. However, not had a chance yet to try them while riding ... we shall see. These are truly good. Zip, Velcro, elastic, size, fit. All of it is good. Insulation as well, obviously. Recommended. I've finally bought a pair of over boots. Should have done it years ago. Easy to fit & no more leaking boots (supposedly waterproof) and wet feet. They pack down small and now live in my top box. I bought the biggest for my size twelve and they go over my footwear with ease. A quality product. Big enough to cover my clown feet. Sole is stiff and looks to be very grippy in the wet however I have not worn these on the bike as yet. Bought these for the run to the Bol & they didn't disappoint. Heavy showers on the way down and torrential thunderstorms returning to Calais - they kept the rain out and my feet dry. Pack up small and easy to slip on. They were too small relative to sizing displayed on order. Size XXL for my size 10.5 bike boots perfect fit used on a tour of Scotland first time in very bad rain, easy to put on due to zip side, good fit with strap so still change gear easy enough. Good grip as well when putting your feet down and walking. 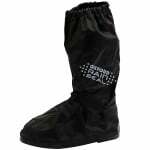 Your normal boots may be water proof for sometime but these will give you dry feet all day. Pack down to the sole size. Fit was good - went with XL for Size 46 boots however, first day out the strap that goes across the front must have caught on footpeg or something & ripped the rivet out of the plastic so now I've a hole where the rivet used to be & will probably tear larger if I wear again. Will try to patch.